Maha Shivratri will be celebrated on 13th February and there is no better place to offer prayers to Lord Shiva than at the Shivoham Shiva Temple in Bengaluru. The day is celebrated as a day of gratitude at the temple, which is reason enough for devotees to be with Lord Shiva at the temple. But here are another 10 reasons why you should celebrate this sacred and auspicious day at the Shivoham Shiva Temple! The Shivoham Shiva Temple is the abode of Lord Shiva home to the beautiful and towering 65-feet-tall statue of Lord Shiva. Who wouldn’t want to be in the presence of Lord Shiva, especially this beautiful benign statue of Lord Shiva that evokes feelings of awe, bliss and peace? 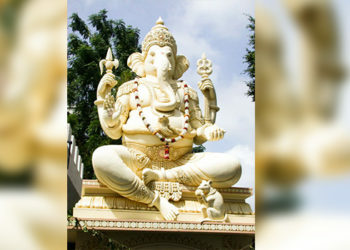 The magnificent 32-feet-tall idol of Lord Ganesha is an added attraction! The statue of Lord Shiva at the Shivoham Shiva Temple is said to be the most powerful statue in the world. Devotees can feel the spiritual vibrations that emanate from the statue. These spiritual vibrations increase manifold during Maha Shivratri. Devotees and visitors alike admit that they can feel the presence of Lord Shiva, and His Divine Energy at the temple. One has to experience it to believe it! The Shivoham Shiva Temple is known as the temple of faith, where dreams come true, prayers are answered and wishes are granted. That is the reason why thousands of devotees keep returning to the temple year after year, sharing their experiences and stories of miracles. One has to pray with faith, and Lord Shiva never disappoints His followers. Since Maha Shivratri is considered as an auspicious day for praying to Lord Shiva, devotees throng the temple for Darshan of their beloved Bholenath, knowing that their prayers will be heard. The Maha Shivratri celebrations at the Shivoham Shiva Temple are unique and very exciting. Diverse, multi-faceted, they are full of grandeur and truly create feelings of Bhakti and devotion. The celebrations begin early in the morning and go on till the next day. Devotees can come at any time to offer their prayers to Lord Shiva and be a part of the mystical and magical celebrations! 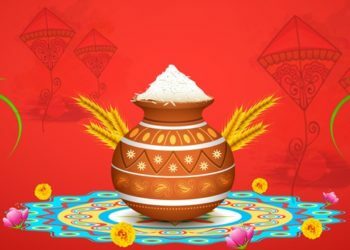 The celebrations at the Temple are based on a concept or theme to promote faith and spirituality that may ultimately help seekers on their spiritual path to understand the truth of Shivoham and attain the ultimate goal of life God-realization. The theme for this year’s Maha Shivratri celebrations is “Perform the Barah Jyotirling Abhishek as an expression of Bhakti and Devotion”. It is a powerful Pooja and extremely beneficial for those who perform it. 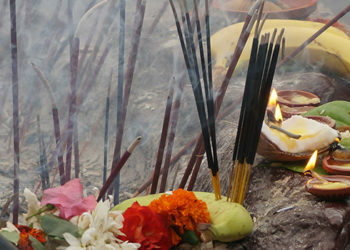 A Shiv Aarti is performed every two hours on Maha Shivratri at the temple. 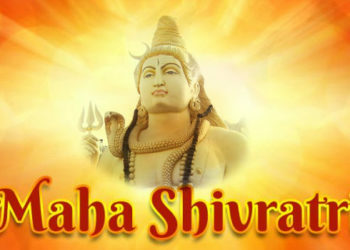 Both believers and seekers can perform special prayers and poojas on Maha Shivratri. While believers may pray for Happiness, Health, Education, Prosperity, Peace, seekers may perform poojas for Grace to attain Moksha, Jivanmukta, Satchitananda, Vairagya, Mumukshutva, Atman, Shivoham. Devotees and visitors can also participate in several faith building and strengthening spiritual activities. One can tie the Shiv Raksha Dhaga on his/her wrist as a symbol of faith and surrender or Light a Diya or Agarbatti. Other activities at the Temple include 108 Om Namah Shivaya Yatra, Breaking a Coconut, Vignaharan Thread, Miracle Coin, Til bathi, Letter to God, Ling Abhishek, the Paanch Dham Yatra and the Barah Jyotir Ling Yatra. Each activity is thoughtfully created to evoke feelings of love for Lord Shiva and deepen the bond between a devotee and God. One of the most distinctive features of the Maha Shivratri celebrations at the Shivoham Shiva Temple is the Shiv Kripa Jagran Express, which is all-night vigil that is observed to make the most of the great night of Lord Shiva and help devotees progress on the path of spirituality, creating a spiritual yearning and awakening that may help them attain God realization. At the Maha Yagna, devotees surrender to God through Arpanam, indicating that they are dropping a bad habit for spiritual growth and evolution. It is a form of surrender, an expression of stoic faith. One of the major highlights of the Maha Shivratri celebrations at the temple the Light and Sound show has a mesmeric and enchanting effect on the young and old alike. Beautiful, vibrant colours, special effects along with mellifluous music and sublime dialogues enthral the audience and make it a surreal experience. The light and sound show is conceptualised to provoke thought and reflection, besides fostering faith. This year, the theme for the special Maha Shivratri Light and Sound show is “Science and Spirituality”. After watching the Light and Sound Show, one may be surprised to know that Science and Spirituality are actually not on divergent paths! 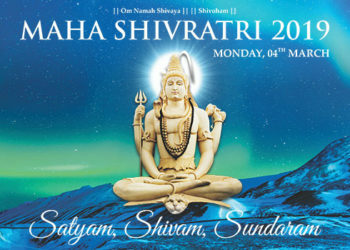 Be a part of the most exciting Maha Shivratri celebrations in the world! Join us at the Shivoham Shiva Temple on the 13th of February. Be blessed!